Welcome to the website of language school Language Siesta. Language Siesta offers courses in Slovak, English, Spanish, Japanese and even Russian. We are teachers Maťa and Lukáš and we are hoping to help you with your language development. Our courses can be individual or in small groups. Our teaching is a relaxing atmosphere and fun, engaging approach. The main benefit of this approach is flexibility and wide range of offered courses. The age of our students varies from 6 to 70, from students to professionals. The lessons can be focused to improve your communication, business skills, general understanding or preparation for a certain certificate. 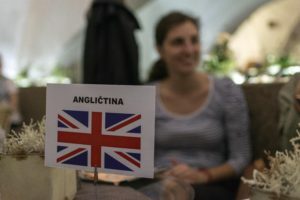 We organize many activities for our students but the most popular is Language Cafe. It is an informal meeting of our students and sometimes general public in a certain coffee shop with the purpose of having a good conversation and, of course, a lot of fun. This course is focused on your individual needs. You can decide your timetable (after agreement with your teacher), as well as the content of your lessons. Group courses can include 2 - 5 students and the focus is generally agreed before the beginning. Learn Slovak language online with us. With popular online applications Skype or Webex it is really easy and all you have to do is contact us. We will plan your lessons and organize your timetable together with you. The benefits of 1-to-1 online lessons with your teacher are flexibility, focus and fast advancement of your language skills.